Situated on the Great Eastern Highway between Cunderdin and Northam this now small hamlet was a busy Wheatbelt town until hit by a devastating earth quake on October 14th, 1968. The earthquake registered 6.9 on the Richter scale, destroying 50 homes and many of the town buildings including the impressive two storied town Hotel. Just west of the town on the highway the earthquake fault line is crossed. Interpretation on the impact of the earthquake plus a telescoped piece of the Perth to Kalgoorlie pipeline is on display in park land in the town. 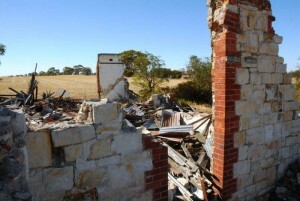 You can also see a ruin of a house that has been preserved, 3km north of Meckering. 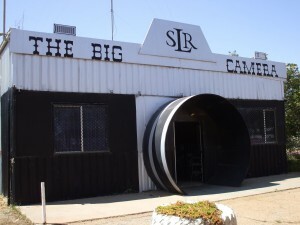 While you are in the area don’t forget to visit the No Pump 3 station museum in Cunderdin which has an earthquake simulation room. The Meckering Big Camera Museum is situated along the Great Eastern Highway. It has displays of items which include cameras, movie cameras, enlargers, processing equipment, slides, projectors, kaleidoscopes and much more.